Got Gazpacho? Amazing Health Benefits From This Cold Soup! Gazpacho is a cold tomato soup originating in Spain and is also very popular in many Mediterranean countries. It has six main ingredients – tomatoes, olive oil, cucumbers, red bell peppers, onions and garlic. It is a delicious and refreshing meal. In a recent study published in the professional journal Nutrition, Metabolism & Cardiovascular Diseases, study authors examined the health benefits of eating gazpacho. One of the primary ingredients in gazpacho is tomatoes. Tomatoes are high in lycopene, an antioxidant that is thought to provide beneficial protection from prostate cancer in men. However, researchers from the Research Group on Natural Antioxidant of the UB found that gazpacho provides additional benefits. According to the study, approximately 25 percent of adults have high blood pressure. However, regular consumption of gazpacho lower blood pressure significantly. Additionally, researchers found that eating the primary ingredients separately also contributed to lowered blood pressure rates. Researchers were surprised, given that gazpacho often contains salt. They theorize that the bioactive elements of the ingredients in gazpacho counteract the potential negative effects of the salt. Tomatoes contain carotenoids, such as lycopene and beta-carotene. Carotenoids are antioxidants that are found in brightly colored fruits and vegetables, such as tomatoes, carrots and other red and orange foods. Antioxidants play a key role in cleaning up free radicals in the blood system and from body tissues. Other carotenoids are important in eye health and also carry anti-inflammatory characteristics. Lutein is a carotenoid with anti-inflammatory agents. Spinach, kale, kiwi and oranges all have high amounts of lutein. Zeaxanthin is another carotenoids that may help prevent eye damage, such as cataracts and other diseases that damage the eye. Green leafy vegetables like kale and spinach have high amounts of this carotenoid antioxidant. Eating foods rich in antioxidants can be beneficial in protecting you from potentially developing cancer and also are known for their anti-aging effects. However, with this current research, scientists are proving that eating brightly colored fruits and vegetables can also help improve cardiovascular health. 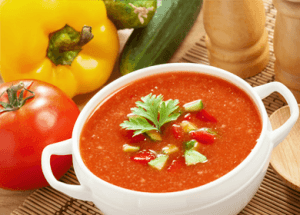 Do you eat foods like gazpacho? What other foods do you enjoy that contain brightly colored vegetables and fruits as main ingredients? A nutrient-rich, satisfying salad-in-a-glass, cool and complex gazpachos blend the taste of vegetables, spices, and herbs. The preparation of traditional gazpachos can be time-consuming. With a blender or food processor, the Kardea recipes only take about 10-20 minutes. All can be prepared quickly with minimal mess, making it perfect for any weekend lunch, a first course, or a part of a lighter summer meal. Make extra gazpacho for a great mid-afternoon snack! A food processor makes preparation very simple and gives you somewhat better control over consistency (a blender also works, but it may take a few batches). Chop vegetables into large chunks; the key is to avoid pureeing the mixture. Use the “pulse” button to coarsely chop. Gazpacho is best prepared fresh, but will last last a closed container in the refrigerator for 3 or 4 days. Chill well, serve with garnishes — chopped, fresh green or red peppers, tomatoes, cucumbers, avocados, or scallions. Try serving in hollowed out peppers. Hey Buddy!, I found this information for you: "Got Gazpacho? Amazing Health Benefits From This Cold Soup!". Here is the website link: https://www.thealternativedaily.com/got-gazpacho-amazing-health-benefits-from-this-cold-soup/. Thank you.